Rest of Today (Thursday): Mix of clouds and sun. Mild and breezy with highs near 80°. Overnight Thursday Night: Patchy cloud cover, chance shower along the South Coast. Lows near 60. Tomorrow (Friday): Increasing clouds and slightly cooler. Chance sprinkle. Highs in the 70s. We start off our Thursday with some areas of patchy fog along with a spot sprinkle. Plus, we’re tracking another unseasonably warm day across the region, even though a weak cold front is traversing the area. As the cold front, representing a new shot of cool air, trudges southward Thursday, it’s likely to bring little more than increased clouds and a sprinkle. Plus, the cool air lags far enough behind the front that most of us will still reach near 80 degrees. By Friday, slow cooling will be underway – 70s for most – with another cold front approaching, in an attempt to deliver a reinforcing shot of fall air. The interesting twist is this front will probably slow very close to us, or even turn around…meaning warm air will not relent, and a warmer-than-normal pattern continues into early next week. That said, upper level disturbances will still help to focus some showers from time to time this Columbus Day weekend, particularly on Sunday and Monday. Early next week, our chance of rain remains elevated as we watch some tropical moisture from the Gulf of Mexico to see just how much of that rainfall reaches this far north. 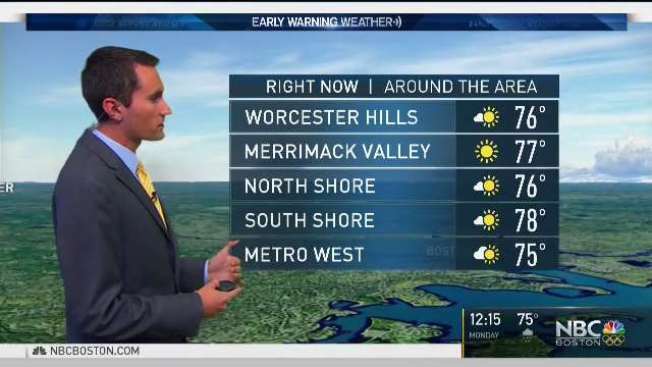 As always, stay with NBC Boston / NECN for the very latest on the air, online and on the go with your Early Warning Weather forecast from New England’s largest weather team.